Can you put spacers between the crossbar and hull until you achieve the performance you're looking for and then fill the crossbar saddle with the appropriate resin and fiber. You might need longer bolts. flightlead we can see the need to lift the rear crossbeam. 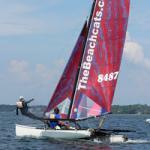 The crossbeam is an integral part of the cat's frame, and blends forces from the mast, hulls and trampoline. Changing it's geometry is messing with physics and structural integrity. Are you sure you're smarter than the designer? Point taken! I still need info on the lift and other performance mods that are available for this particular boat. Another great boat that joined the Dead Boat Society. Somewhere here or on Catsailor is a 10 year old thread about the mod. Maybe try Lars Guck. It's mounted on top of sections of the same beam extrusion somehow. Not sure how it's welded/bolted or how tramp attachment is handled. There’s currently one of these boats for sale in the classifieds on this site. Based on the pictures, it looks like they probably shaped a riser out of foam and then glassed it into the hull. Maybe you could contact the seller directly to see if they can provide more details. Normally that's the case, but evidently the designer bit the big one on the 18HT rear beam design. They all seem to be modified one way or another to raise the rear beam. So flightlead it's not your imagination. How To Display Pictures I…he Forums in the forums. we can see the need to lift the rear crossbeam. flightlead- it turns out you ARE smarter than the designer! It's a friend's Bimare F18HT, but he didn't build the beam mod....it came off another boat. As I understand it, the previous owner of the beam had it fabbed, but I don't know if it was his design or from some other source. Hopefully this will give you some ideas for your solution. This list is based on users active over the last 60 minutes.